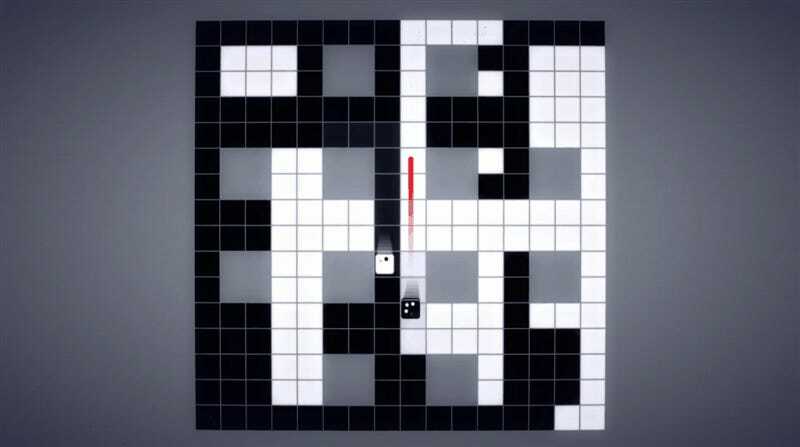 Inversus is a simple black and white strategy shooter that pits players against each other in an ever-changing battle for territory and survival. As minimalist competitive shooters go, it’s pretty much perfect. Created by Ryan Juckett, AKA one-man game studio Hypersect, Inversus started off as a game jam idea and developed into something that’s a mix of twitch shooter and classic board game. Players, cast as either black or white rounded squares, fire bullets that not only destroy their opponents, but also change the color of the board as they travel, opening up new paths while closing off the route of the enemy. The concept is very simple, giving players plenty of room to complicate things on their own. I play a one-on-one match in the video above. I played two-on-two during judging for the Momocon Indie Game Awards earlier this year, and it was just ridiculous. There was trash talking. Bullets were being negated by enemy bullets. Wins were extracted from asses at the very last moment. Such wondrous chaos. Inversus is available now on Steam and the PlayStation 4 for $13.49 (normally $14.99). It comes with local and online multiplayer for up to four players, as well as a one and two-player arcade mode.